Luxury is about to be redefined in London. An ambitious project plans to build a ?sky pool? made entirely of glass and hanging 10 stories above the ground. 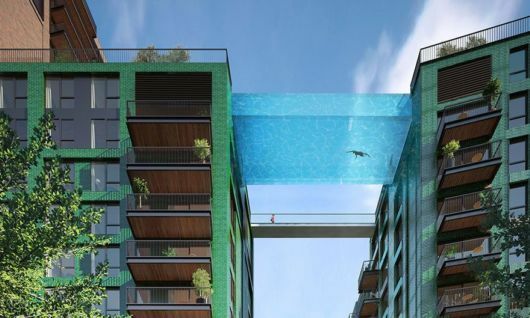 The 25 by 5 meter by 3 meter deep pool will be made of 20 cm thick glass, and will act as a sort of bridge between two apartment buildings in London?s Nine Elms district. On site construction begins this year, and in 2018 buyers will be able to move in. ?My vision for the Sky Pool stemmed from a desire to push the boundaries in the capability of construction and engineering,? said Ballymore Group CEO Sean Mulryan. ?I wanted to do something that had never been done before. The Sky Pool?s transparent structure is the result of significant advancements in technologies over the last decade. The experience of the pool will be truly unique; it will feel like floating through the air in central London.? ?I wanted to do something that had never been done before?